Motorcycle battery needs to provide enough power to start the engine, be durable enough to last a long time in any kind of climate and if it’s not a sealed battery, easy to service. The perfect motorcycle battery has the kind of features that ensure it is going to last a long time. Our pick, Battery Tender Lithium Iron Phosphate Battery, is a quality quad terminal battery that is 80% lighter than other standard motorcycle batteries. It doesn’t matter how good a motorcycle’s engine is, without a battery it won’t do much good. The requirements for a motorcycle battery are fairly simple. There are other things to consider as well including warranties that the battery has, amperage requirements of the motorcycle, battery cost, and your riding style. All these considerations are necessary to sort through the different choices so you can find the perfect one for your needs and your specific motorcycle. Motorcycle batteries come in all sizes and amp ratings. You can also choose between rechargeable, sealed and unsealed as well. The benefit to sealed batteries is that they are maintenance-free. Rechargeable batteries do not need to be replaced as often as regular motorcycle batteries do but they will be more expensive. Make sure that your particular motorcycle is compatible with the rechargeable battery you are considering so you don’t spend the money for nothing. You also need to remember not to replace a sealed battery with an unsealed model so you don’t damage the motorcycle or battery. Battery Tender motorcycle batteries have a lot of features that make it a popular choice among motorcycle owners. It fits all battery boxes using foam blocks that are included with the purchase. It contains no liquid and lasts 5 times longer than acid batteries. This motorcycle battery features a quad terminal style and is a lot lighter as well which is great for your motorcycle. Installation is super easy thanks to the fact that this battery can be mounted in any direction. It is the perfect battery for your motorcycle, dirt bike, utility vehicle and many more battery run vehicles. The Battery Tender Battery is as much as 80% lighter than other batteries and provides 2000 or more deep cycles at roughly 80% discharge depth. This 12v powerhouse features 240 cold cranking amps and has an operating temperature of 40 to 140 degrees F. This is a great choice for a new battery for your motorcycle at a reasonable cost as well. The spill and leak proof Harley Davidson motorcycle battery is ready to install, made in the US, and is maintenance-free to boot. This high quality battery provides the same performance as an Original Equipment battery will. It will fit Ultra Classics, Street Glides, Road Kings, Electra Glides, and Road Glides from 19976 to 2016. The microfiber separators are highly porous. These separators absorb the acid and trap it making the battery safe from leaks and spills. The Harley HDX30L is ThrottleX’s most well liked and purchased motorcycle batteries. It is not a particularly light battery at 23 pounds but the quality makes it worth it. This popular motorcycle battery has new bolts that are included and made from stainless steel. The heat sealed cover and solid lead female threaded terminals are other features this durable battery has as well. The HDX14L comes with a 30 day money back guarantee and provides 18 months free replacement as well. This iGel battery from Chrome Pro has been injected with gel electrolyte and has many features that make it a terrific motorcycle battery for your bike. Features include a built-in intelligent chip, a digital display that reads the alternator and battery voltage and an alarm that warns you of low voltage or abnormalities. When an iGel battery is installed it automatically records the working date and features a longer service life than SLA batteries. 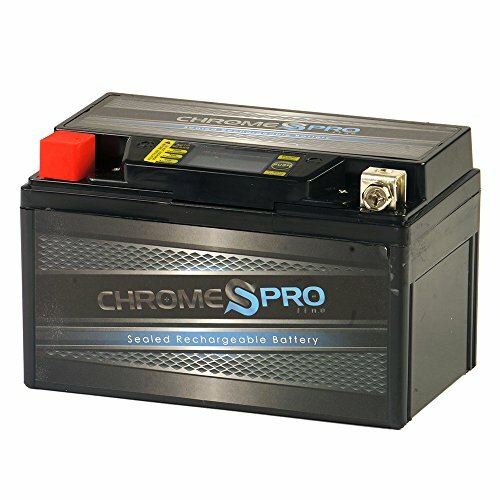 This maintenance free battery has no water to check, no leaks or spills to worry about and allows you to always know what your battery life is. The terminals are heavy duty and long lasting. Other features include extreme vibration resistance and an improved life cycle performance. The company’s top rate customer service is second to none and ensures that you are completely satisfied. 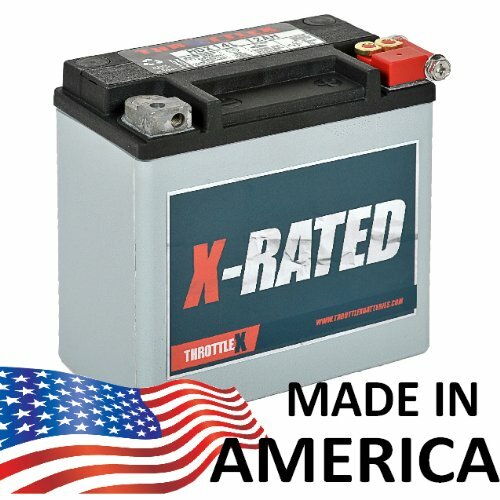 This affordable battery has a 60 day, no questions asked money back guarantee and comes with an 18 month parts warranty. You will love the quality of this high performance iGel motorcycle battery as well as the exceptional customer service that stands behind their products 100%. You can start your motorcycle without a battery. Finding a battery that provides the power and features you want is not hard at all if you know what to look for and how to tell a good quality battery from one that will only disappoint. The purpose of the buyer’s guide below is to help you understand the features and quality that make a great motorcycle battery. The three batteries we have reviewed above are all from reputable motorcycle battery companies that stand behind their products. Any one of them are excellent choices but remember to make sure that they will fit your make motorcycle make and model. To learn more about motorcycle batteries and how to choose the right one for your needs, keep reading below. We have provided you with valuable information on how to choose the right battery for your motorcycle and how to be confident in that decision. There are several factors involved in choosing the perfect motorcycle battery. Where you will be riding, the size of the motorcycle and the climate are all very important in determining the amount of cold-cranking amps that are delivered by the battery. We have listed a few things below that will determine the kind of battery that will work well for your motorcycle. What is your riding style? – If you are an occasional, weekend motorcycle rider you will actually need a more powerful battery that lasts longer to compensate for the fact that the batteries for these infrequently ridden motorcycles are not usually charged or revitalized by the alternator. Cost – Motorcycle batteries vary in cost depending on the power they put out and the features they offer. Don’t choose a battery based on price alone. Look for the one that offers the power, amperage and maintenance-free capabilities that you want. Automatic Drain – Lead-acid batteries will lose power when they are not being used regularly. A daily drain on a lead-acid battery is usually anywhere from0.5% to 1% of the total power of the battery. If you ride your motorcycle infrequently, be sure to use a trickle charger to avoid a dead battery when you are ready to ride. Make sure that you choose a rechargeable battery if you are a rare bike rider to avoid overcharging a standard battery. Power rating – Most motorcycle batteries that fit full-sized motorcycles are 12 volts. Some of the smaller motorcycles will use a 6 volt battery. Motorcycles have different amp requirements so make sure you know what your bike’s requirements are when you are choosing a battery. You want to purchase a battery that has the needed amps and power to run your motorcycle well. There are several things that you want to think about when you are researching different motorcycle batteries. We have listed all these considerations below. Remembering these pointers and following them when you start shopping for your motorcycle battery will ensure that you get the best battery for your money. Choose the best battery for your specific motorcycle – Look at your old battery and take note of what size it is. You will need to choose a battery that has the right volts, amps and size as the battery you are replacing. Never use a different sized battery than what is already being used by your motorcycle. Stay within your motorcycle’s specifications – Every motorcycle is designed to use a specific sized battery. Stick with these specs and you’ll always have the best battery for your bike. Look for a long lasting battery – If you feel like your regular motorcycle battery doesn’t last very long, look for a longer lasting model as long as it is the correct size for your motorcycle. Motorcycles are notoriously tough on batteries so finding one that can take the punishment and last longer is your objective. Maintenance-Free batteries last longer – Maintenance-free batteries do not require any work to be done on them to keep them running well. Many maintenance free batteries will come with warranties that can last 1 to 2 years or more. Since motorcycles have a continuous drain on their batteries, a maintenance free one will last longer and stand up to the demands of this drain better than standard models. Maintenance free batteries are also known as sealed batteries. There is no worry about spilling or leaking battery acid on the ground with a sealed battery. Brand names are not always best – There are many things to look at when it comes to buying a good quality motorcycle battery. Brand name can play a part in this decision but it is not the only factor you should look at. You are looking for a battery that fits your bike well and that has a higher capacity than other batteries. If everything else is the same in two batteries you are comparing, it is fine to go with the better known brand. Look for good guarantees and warranties – A good quality battery will have at least a one year warranty on it. Most offer replacement warranties of 1 to 3 years depending on the quality and size of the motorcycle battery. Many also have 30, 60 or 90 day money back guarantees as well. A good battery will normally at least three years which goes along with the recommendation to purchase a new motorcycle battery every three to five days. Think about what you want in a battery – If you don’t plan on charging your battery very often you will want to purchase an AGM battery. This type holds gravity a lot longer than regular batteries and does not need to be charged the way a standard motorcycle battery does. This is a great choice for motorcycles that are stored for longer periods of time such as through the winter. If you are looking for a battery that is reliable and rugged as well, a conventional motorcycle battery should fit the bill just fine. They are dependable and will work well in any weather. They also handle harsher environments and vibrating surfaces much better. Trip Length is Important – If you ride your bike on a regular daily basis to work and back, to the store and other short excursions you will want to get a battery that does not need a lot of charging. The alternator will not have time to charge the battery for very long when you take a lot of short trips so make sure the battery you choose can handle that. Check the battery with your existing charger – Make sure that the new motorcycle battery you purchase works with your existing battery charger. You will need to keep this charger with you at all times when you are riding. This will help you charge your battery wherever you are if the need arises. It is better to carry it and not need it than to leave it at home and need it. Be careful when changing your battery – When you are changing your motorcycle battery it is important that you remember to wear protective clothing and gloves as well as goggles. If there are any spill from changing a standard battery, clean them up with baking soda and water immediately. There are many different brands and types of motorcycle batteries on the market to choose from. The best battery for your needs and your motorcycle is the one that has the features and warranty you want, the power, size and amps you need and have the staying power you require as well. Not having to worry needlessly about your battery will make for a much less stressful ride as well as less expensive ride since you won’t have to replace the battery as often. Many batteries have the same characteristics, so when choosing from several that are all the same, look at reputation of the company, customer comments from those who have previously purchased the battery and which battery offers you all the features you want. Choosing the right battery may not be a complicated decision but it is a very important one since the battery determines how well your bike runs and how reliable the battery is in different kinds of weather and temperatures. By taking the time to research different models you will be able to make an informed decision on a battery that will be just right for your particular motorcycle. The three choices we have featured above are all good brands and batteries to consider. If you have a motorcycle that any one of these batteries will fit, you will have a high quality battery that you will be happy with for several years.